In this groundbreaking volume, leading practitioners and scholars from around the world provide an authoritative review of the most up-to-date information available on performance interventions, all presented within a holistic framework that helps ensure the accomplishment of significant results. Addressing more than 30 performance interventions, with such varied topics as Incentive Systems, e-Learning, Succession Planning and Executive Coaching, this volume guides readers through the development of comprehensive performance improvement systems. Each chapter illustrates in practical terms how to select, plan, implement, and manage performance interventions, as well as how to evaluate their results. Through best practices research, comparative analysis, illustrative case studies from around the world, and editorial guidance on how to link together diverse interventions, the handbook is an important guide for achieving desired results in the workplace and beyond. 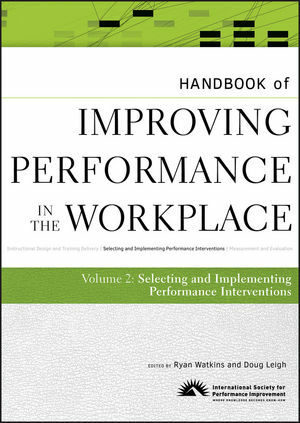 Sponsored by International Society for Performance Improvement (ISPI), the Handbook of Improving Performance in the Workplace, three-volume reference, covers three main areas of interest including Instructional Design and Training Delivery, Selecting and Implementing Performance Interventions, and Measurement and Evaluation. Ryan Watkins is an associate professor with the George Washington University in Washington, DC. He teaches and does research on needs assessment, system analysis and design, instructional design, and distance education. Ryan is the author of 75 E-learning Activities and co-author of Strategic Planning for Success (Pfeiffer), as well as five other books, including Performance by Design, and the E-learning Companion. Ryan is an active member of ISPI and frequent contributor to its journals. Doug Leigh is an associate professor of education with Pepperdine University's Graduate School of Education and Psychology. His current research, publication, and consulting interests involve cause analysis, organizational trust, leadership visions, and dispute resolution. Doug is co-author of Strategic Planning for Success and Useful Educational Results, a two-time chair of the American Evaluation Association's needs assessment topic interest group, and past editor-in-chief of the ISPI's journal, Performance Improvement. For more on Ryan and Doug's work, including podcasts with contributing authors to the handbook, visit www.needsassessment.org.